Almost inevitably, Daniel Sturridge put the sheen on this display for Liverpool, but there was little argument that Raheem Sterling was the star that shone brightest to secure a hard-earned victory against West Ham United. Sturridge returned, from five months out injured, as a substitute in the second half against the Hammers, and within 12 minutes of his entrance had finished off the kind of chance that Liverpool have frequently struggled to convert in his absence. Rodgers, though, was keen to urge caution over the expectation placed upon Sturridge, given that this was the first time he had featured for the Reds since their 3-0 victory over Tottenham Hotspur at the end of August. �It was nice for him and he�s been out for a long time,� Rodgers said. �It�s about managing his game time. When he�s in that area, he�s shown he�s lethal. �Daniel is a top-class player � he has shown that in his career so far. He worked very hard, and the first opportunity that came his way he took. Despite Sturridge�s goal, there was no denying that Sterling was the central figure in Liverpool�s dominance of Sam Allardyce�s side. At the beginning of the month, Rodgers afforded the 20-year-old the luxury of a sunshine break in Jamaica, and it appears to have refreshed and re-energised the youngster. Sterling has been playing his best football of the campaign since then, and he was simply in a different class to everybody else on the pitch at Anfield . Allardyce�s side have been one of the Premier League�s surprise packages in this campaign, but they were facing a tough ask to win against Liverpool. The last time West Ham came away from Anfield with maximum points in a league game, Harold Macmillan was prime minister and She Loves You by the Beatles was No.1 in the charts. On that day, in September 1963, Geoff Hurst and Martin Peters scored in a 2-1 win � and, no doubt, both would have approved of Sterling�s display. In some respects, Sterling, so light on his feet and with the ball seemingly glued to his bootlaces, is a throwback to the wingers of that era, and he was Liverpool�s major threat, albeit in a more central role. 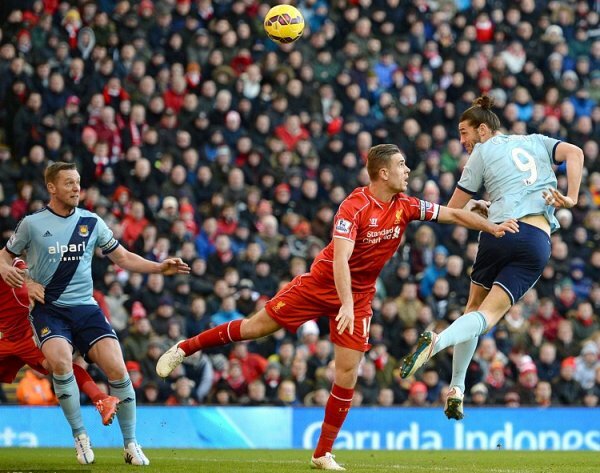 Sterling should have won a penalty just before half-time, when Joey O�Brien grappled with him, and, seconds later, Lazar Markovic missed a golden chance to put Liverpool ahead when he seized on Stewart Downing�s sloppy pass, but � with just the West Ham keeper, Adrián, to beat � he fired past the post. However, six minutes after the break, Sterling scored the goal that his impressive display thoroughly deserved when he finished off a slick Liverpool move. He was picked out on the edge of the box by Alberto Moreno, on the left flank, and, with his back to goal, chested the ball to Coutinho, adroitly spun Winston Reid, and � when he collected the return pass � struck a low shot past Adrián. Anfield rose to its feet to salute Sturridge�s entrance to the pitch in the 68th minute, and the striker showed that his razor-sharp instincts have not been numbed, as he sealed the win with Liverpool�s second goal. He received a clever ball from Coutinho and fired past Adrián at his near post, to put the icing on the cake for the Reds. There was not a hint of nervousness about Sturridge�s finish, but the same might not be said of Liverpool�s top-four rivals, who will all be glancing over their shoulders. �The penetration and, slowly, the performance is getting better and better,� said Rodgers. �Offensively, we were bright, and the positioning of the team was good, with really good tactical discipline in the team. �Again, defensively, when they had to deal with the pressure � I thought Sakho was outstanding, really aggressive and strong, with Martin Skrtel; both of them were very good. Allardyce had few complaints with the result and was left counting the cost, with injuries to Andy Carroll and James Collins, who both limped off clutching their hamstrings.